Beginning Saturday, railroads must notify states when certain large shipments of crude oil come through by train. The new rule is in response to safety concerns with crude-by-rail. The emergency order, issued by the federal Department of Transportation last month, applies to trains carrying a million gallons or more of crude from the Bakken formation in North Dakota. That's the oil that has exploded in numerous fiery derailments, including one in Quebec last summer that killed 47 people. Brad Alexander, spokesman for California's Office of Emergency Services, says the state hasn't received any notifications yet, but has gotten a non-disclosure agreement from Burlington Northern Santa Fe Railway (BNSF). "As a public entity, we can't sign a non-disclosure agreement," he said. "But we want to let BNSF know that we will be treating this information with great respect and keeping it in accordance with federal and California laws." BNSF said Friday the company will comply with the order, even if states don't sign the agreement. The railway operates oil terminals in Richmond, Sacramento and Bakersfield. The other major railroad in California, Union Pacific, said through a spokesman that it does not currently transport any Bakken oil through California. Aside from BNSF's facilities, there are three other existing crude-by-rail operations in California that could take in crude oil from the Bakken or from other mid-continent fields. Other fields produce less volatile crude than the Bakken formation. And five more crude-by-rail terminals have been proposed, including two in the Bay Area: the Valero refinery in Benicia and the WesPac oil terminal in Pittsburg. Crude-by-rail has been a growing industry -- and concern -- as a North American oil boom has developed. Without pipelines to transport oil from Alberta's tar sands and North Dakota's Bakken, oil companies have turned to trains to get crude to coastal refineries. 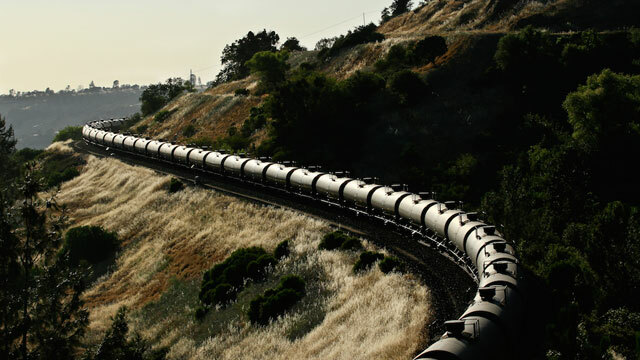 In January 2013, about 156,000 barrels of oil came into California by rail. By the end of the year, that number had increased nearly eight-fold. In December 2013, oil companies brought more than a million barrels into the state by rail. Now, that still accounted for only one percent of all the oil refined in the state in 2013. But if all the proposed oil terminals go through, crude-by-rail could account for 23 percent of California's oil. As the number of trains carrying oil across the country has gone up, so have accidents. Lynchburg, Virginia and Casselton, North Dakota were both recent sites of derailments and explosions. Diane Bailey of the Natural Resources Defense Council said she's concerned about safety in California, too. "None of these massive oil infrastructure projects should be moving forward while we’re still working to understand and address the public safety risks at local, state and federal levels," she said. In addition to the DOT's emergency order, the Pipeline and Hazardous Materials Safety Administration sent proposed regulations on crude-by-rail to the White House earlier this year. Those are expected to be made public later this summer. Meanwhile, legislation from Congressman Mike Thompson, a Bay Area Democrat, has passed the House as part of the Intelligence Authorization Act. If passed by the Senate, it would require the Department of Homeland Security to study the safety of oil refineries and railroads that connect to them. On the state level, Senator Fran Pavley, a Democrat from Agoura Hills, introduced a bill that would focus California's Office of Spill Prevention and Response (OSPR) not only on marine oil spills, but on inland spills as well, like those that might occur from rail. That bill has passed the Senate and is now in the Assembly. In his budget proposal earlier this year, Governor Jerry Brown put $6.7 million towards OSPR, citing the rise of crude-by-rail. Finally, Assemblyman Roger Dickinson, a Sacramento Democrat, introduced AB 380, which would require railroads to give more information about crude-by-rail shipments to emergency responders. That bill is in a Senate committee.